RBC — Rio Blanco County’s fairgrounds are quiet this week. At least compared to last weekend. The place was buzzing all weekend long — and even before that — with all sorts of activities associated with the annual Rio Blanco County fair. One of the highlights each year, as well as the grand finale of the fair, was the livestock sale last Saturday night. From Megan Ridings, 17, of Meeker, who has been involved in 4-H since she was 6, to Mary Jane Davies, 87, visiting from Nipomo, Calif., youth, as well as adults, of all ages participated in the fair. Davies was in town visiting her daughter and her husband, Carol and Rick Rowlee, and was persuaded to enter one of her chocolate fudge pies in the county fair. The fair culminates months of hard work and investment by 4-H’ers and their parents. And it has its rewards. Just ask Dr. Kellie Turner. Her husband, Coley, was in a Denver hospital, while their son, Casey, 9, the only one of their three children old enough to compete in 4-H, was showing his animals in the fair for the first time. But, unfortunately, his dad couldn’t be there. The previous weekend, during the 4-H horse show, Coley had his right thumb almost completely severed in a roping accident. Ironically, Coley is the former shop teacher at Meeker High School, Kellie said. He will switch to teaching physical education this year. “I told him you finally get out of shop and switch to PE and he almost loses a finger,” Kellie said. She wasn’t at the fairgrounds when her husband’s accident occurred. “When I heard I was getting ready to go to (the Smoking River) powwow,” she said. Kellie, who is a general practice physician, accompanied her husband on the helicopter flight from Meeker to Denver. So, while Coley was in the hospital, Casey was showing at the county fair. Doctors in Denver re-attached Coley’s thumb and the prognosis looks good, Kellie said. He came home from the hospital Monday night. In Coley’s absence, family and friends stepped in and rallied around around Casey, offering help and encouragement during the fair. By the way, Casey won showmanship in the junior swine division. 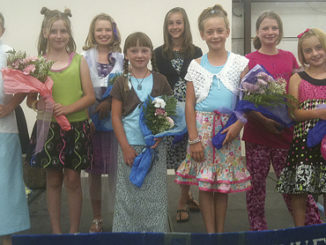 RBC I The Rio Blanco County Fair contests kicked off last week with great attendance and talent from our 4-H’ers! 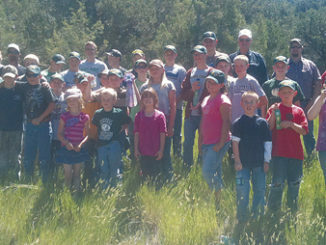 Twenty-eight RBC 4-H shooters competed in the annual Rio Blanco County Fair County Shoot-off at the Meeker Sportsman’s Range Saturday last.